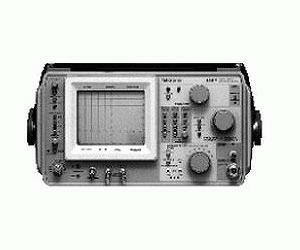 The Tektronix 496P is a rugged portable, digital storage, and programmable Spectrum Analyzer. The 496P high stability and 80 dB dynamic range meet your demands for proof-of-performance measurements, on site or on the bench. Simple 1, 2, 3 knob adjustment sets center frequency, frequency. span and reference level. The digital storage will eliminate your time-consuming display adjustments. Save A, B Minus Save A, Max Hold and Average modes makes it easy to save time while discovering true spectral analysis. Constant tuning rate lets you position the signal quickly and accurately at any frequency span. bandwidth offset.